"I am always inspired when I remember the many important men who walked this land of Washington on the Brazos. Many of our most celebrated forefathers lived here or came through here. " Washington on the Brazos State Historic Site is located midway between Austin and Houston. It offers many onsite amenities open daily, as well as an incredible schedule of events and programs about Texas history and Mother Nature. On the grounds of this 283-acre, TPWD-run state park is Independence Hall (the site in 1836 where the representatives met to write the declaration of independence); the Star of the Republic Museum (collections honoring the history, cultures, diversity and values of early Texans; administered by Blinn College); and Barrington Living History Farm(where interpreters dress, talk, work and farm as the earliest residents of the original farmstead did). The site’s Visitor Center features interactive exhibits which present a timeline of the Texas Revolution and highlight the historic attractions located within the park; it also houses the spacious Washington Emporium Gift Shop, which offers snacks and a wide range of Texas-themed items and keepsakes. The Fanthorp Inn State Historic Site is a wonderfully preserved example of a 19th century stagecoach inn, located nearby in Anderson, TX. The entrance to the park grounds, Visitor Center and parking is always complimentary; fees apply for access to Barrington Farm and the Star of the Republic Museum, and for tours of Independence Hall. Permanent Exhibit - Pioneer Playroom, Star of the Republic Museum: The Museum’s new Pioneer Playroom simulates an early Texas frontier homestead that allows participants to immerse themselves in the role of pioneers through role-playing, interactive experiences and a variety of learning styles. Children can load and sit on a buckboard wagon, dress in clothing characteristic of the period, build a log cabin, wash and hang laundry, haul water, milk a cow, gather eggs from a chicken coop and more. Contact Houston McGaugh at 936-878-2461 or hmcgaugh(at)blinn(dot)edu. Through February 15, 2017 - A Legacy of Leadership: The Signers of the Texas Declaration of Independence Exhibit – Star of the Republic Museum: The exhibit focuses on the delegates to the Constitutional Convention in 1836—those leaders who determined the future of Texas. Among them were 12 lawyers, five physicians, four surveyors and three each of planters, empresarios and merchants. The exhibit includes personal artifacts such as Sam Maverick’s buckskins, a cameo of Michel Menard, oil portraits of Stephen Blount and his wife, and many others items. Contact: Shawn Carlson (936)878-2461, ext 241 or scarlson(at)blinn(dot)edu. August 20 & Sept 17, 2016 – Living History Saturday, 10 a.m. – 4:30 p.m.: Travel back in time to where a nation was born in 1836. On the third Saturday of each month staff and volunteers dressed in period clothing bring to life the people and events of Old Washington providing a unique opportunity to discover various aspects of life surrounding the birth of the Republic of Texas. The program features activities suited for the entire family. Try your hand at writing with a quill pen and sign a copy of the Texas Declaration of Independence. 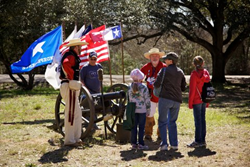 Visit with militia soldiers travelling through town or try your hand at some early Texas games. Step back in time and discover the spot where Texas became Texas! (Activities will vary and some are weather dependent). Traditional guided tours of Independence Hall will not be offered these days. Contact: Jon Failor at (936) 878-2214 ext. 224 or jon.failor(at)tpwd(dot)texas(dot)gov. Saturday, September 3, 2016 - Turtle! Turtle! – Turtles and Tortoises of Texas, 1 – 3 p.m. – Education Center: This seminar will discuss Red-eared Sliders, Texas Tortoises, other turtles and tortoises common to the area and State, as well as the difference between turtles and tortoise; what action to take if a tortoise or turtle is found; and which are protected. The session will last approximately 1½ to 2 hours, including classroom education and a nature walk, and is hosted by the Gideon Lincecum Chapter of Texas Master Naturalists in partnership with TPWD. Contact: Karen Ginnard at (713) 584-9756 or kginnard56(at)gmail(dot)com. September 10 and October 8, 2016 – Stagecoach Days, 11 a.m. - 3 p.m.: Fanthorp Inn will host Stagecoach Days allowing visitors to experience what it was like to travel cross-country via stagecoach and learn about the Inn’s history and connection with early stage lines. There is no admission fee to visit the inn, with a suggested donation of $10 for adults and $5 for children for stagecoach rides. Rides last approximately 15 minutes and Inn tours for 30-45 minutes. Contact: Jon Failor at (936) 878-2214 ext. 224 or jon.failor(at)tpwd(dot)texas(dot)gov. Saturday, October 1, 2016 – Snakes Alive! – A Study of Snakes in the Washington County Area – 1 p.m.– 3 p.m. – Education Center: Snakes are interesting and diverse creatures, and as most property owners in Texas know, they often come free with the property. The beauty and habits of snakes routinely seen at Washington on the Brazos will be discussed including Copperheads, Texas Rat Snakes, Coral Snakes, Brazos Water Snakes and others. Live specimens may be on hand in containers. Session will last approximately 2 hours, including classroom education and a nature walk, and is hosted by the Gideon Lincecum Chapter of Texas Master Naturalists. Contact: Karen Ginnard at (713) 584-9756 or kginnard56(at)gmail(dot)com. October 8-9, 2016 – Plow Days – 10 a.m. – 4 p.m. – Barrington Farm: Preparing the fields for winter crops and controlling weeds is an important task on the farm. Amending the soil is also part of this process by adding manure and other nutrients. The Texas Draft Horse and Mule Association will prepare the fields at Barrington on plow days. Contact Bruce Wardlow at (936) 878-2214 ext. 246 or bruce.wardlow(at)tpwd(dot)texas(dot)gov. November 5, 2016 – Night at the Star of the Republic Museum, 7 p.m. – 9 p.m. – Star of the Republic Museum: Explore the museum in a new light…a flashlight. After the lights go down in the museum, the exhibits come to life as live characters step out of the exhibits to tell the story of the Texas Republic. Guests should bring a flashlight. Adults/$5; students/$3; children ages 6 and under and all those with current Blinn College ID are no-charge. Contact Houston McGaugh at 936-878-2461 or hmcgaugh(at)blinn(dot)edu. Visitors should call the park at (936) 878-2214 to confirm all of these dates and times; events subject to change based on weather, etc. Leashed pets allowed in park, but NOT allowed onto farm site or in the buildings. Attractions are accessible for the mobility impaired. For lodging information, please contact the Brenham Visitor Center at http://www.visitbrenhamtexas.com/ or 1-888-BRENHAM, or the city of Navasota at http://www.navasotagrimeschamber.com. Washington on the Brazos State Historic Site is found on the Brazos River at the original townsite of Washington, Texas, a major political and commercial center in early Texas. It is located at 23400 Park Road 12, Washington, TX, 77880—approximately halfway between Brenham and Navasota, off of State Hwy. 105. From Hwy. 105, follow either FM 912 or FM 1155 to Park Road 12. For additional information, call (936) 878-2214 or visit the site’s website at http://www.wheretexasbecametexas.org.